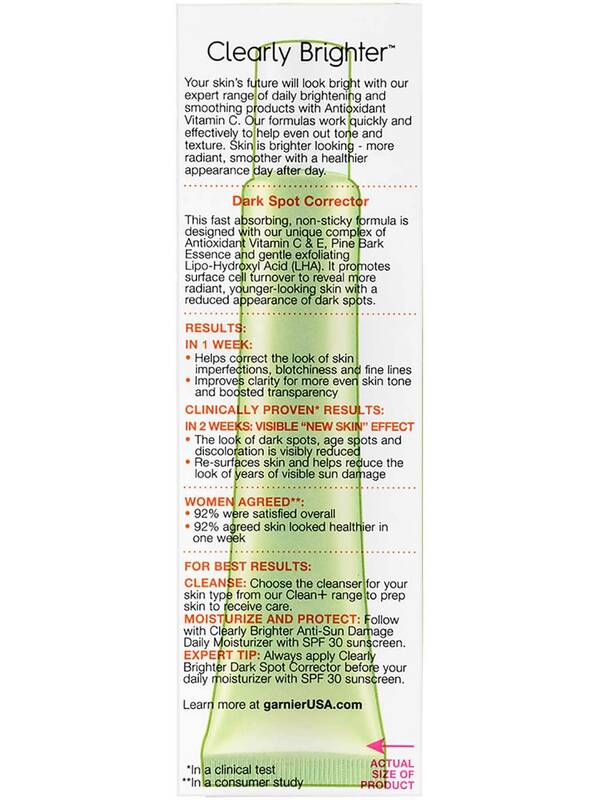 Reduces the look of years of sun damage. Brightens skin. This fast absorbing, non-sticky formula is designed with our unique complex of Antioxidant Vitamin C & E, Pine Bark Essence and gentle exfoliating Lipo-Hydroxyl Acid (LHA). It promotes surface cell turnover to reveal more radiant, younger-looking skin with a reduced appearance of dark spots. Apply twice daily to face and neck after cleansing. Smooth a dime size amount evenly until absorbed ensuring all dark spots and uneven tone are fully covered. 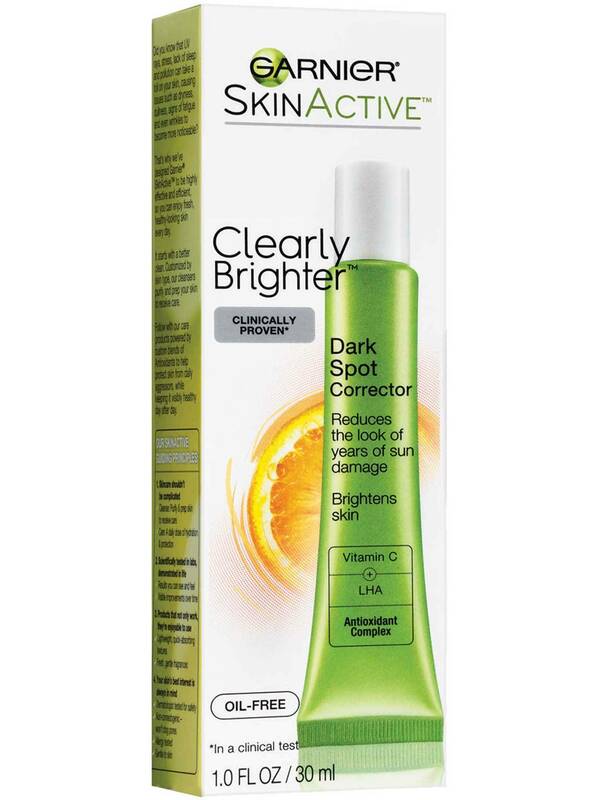 For best results follow with a Garnier® SkinActive™ Clearly Brighter™ Daily Moisturizer with sunscreen. Aqua/Water, Glycerin, Ascorbic Acid, Hydrogenated Polyisobutene, Cyclohexasiloxane, Potassium Hydroxide, Dimethicone, Sodium Styrene/Ma Copolymer, Acrylates/C10-30 Alkyl Acrylate Crosspolymer, Alcohol, Benzyl Salicylate, Biosaccharide Gum-1, Carbomer, Citral, Citrus Medica Limonum Extract/Lemon Fruit Extract, Disodium EDTA, Gentiana Lutea Extract/Gentiana Lutea Root Extract, Geraniol, Glyceryl Caprylate, Hydroxyethylpiperazine Ethane Sulfonic Acid, Limonene, Linalool, Nylon-12, Peg/Ppg-18/18 Dimethicone, Phenoxyethanol, Salicylic Acid, Sodium Anisate, Sodium Hydroxide, Sodium Levulinate, Sodium Methylparaben, Tocopheryl Acetate, Xanthan Gum, Parfum/Fragrance, F.I.L. B46866/1. Rated 5 out of 5 by KellyMHolbert2 from Loooove it I suffer from adult acne leaving scars behind. 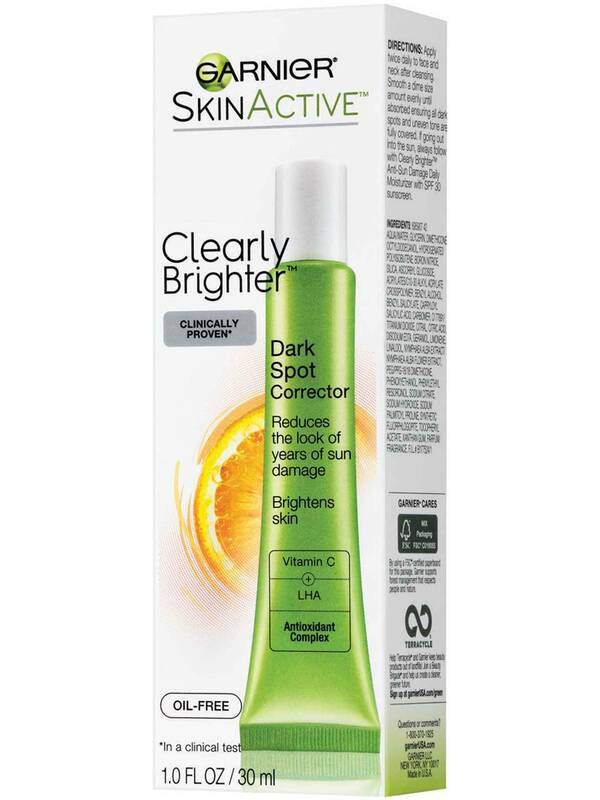 I’ve used this product for years and it always helps clear up those dark spots. I love the new formula, smells great and works great!! I only apply it to my whole face at the end of the night before bed so the glitter doesn’t bother me at all... In fact it make me look not so sleepy after chasing after two little humans all day! Rated 1 out of 5 by NYgoddess from Bring the old formula back....disappointed I used to buy the original formula all the time and it worked very well. I took a break from it to try new products which didn't work as well so I decided to give this product another try but now it has a new formula thats not even close to as good as the original formula. This Definitely has way less Vitamin C and is less effective due to this new formula. I unfortunately won't be purchasing this again because the new formula is a watered down version of the old one. Rated 5 out of 5 by Rsue92 from This Actually Works! I bought this almost 6 months ago. 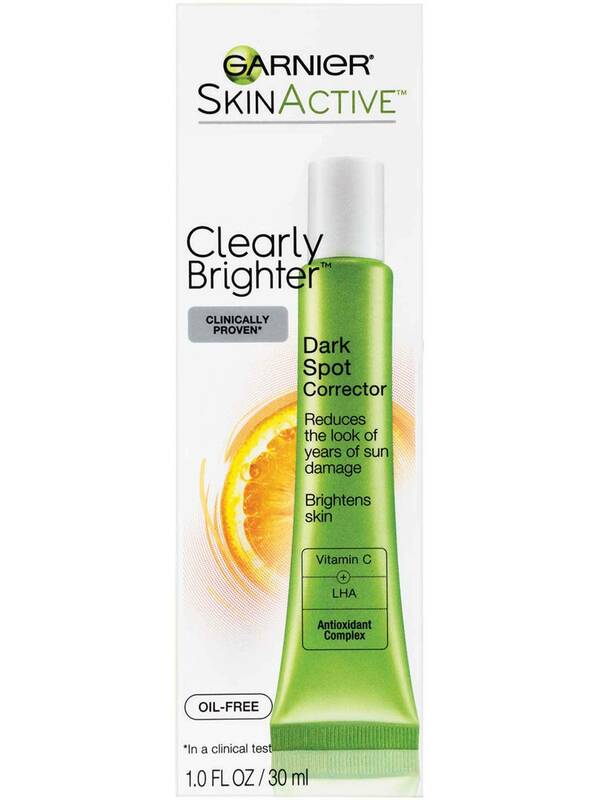 I was using it on and off and did see some noticeable brightening in my skin. The past few days I've been applying it twice a day and I'm already seeing an improved overall brightness and my skin looks clearer! I just purchased the daily moisturizer with spf 30 so I'm looking forward to trying that! 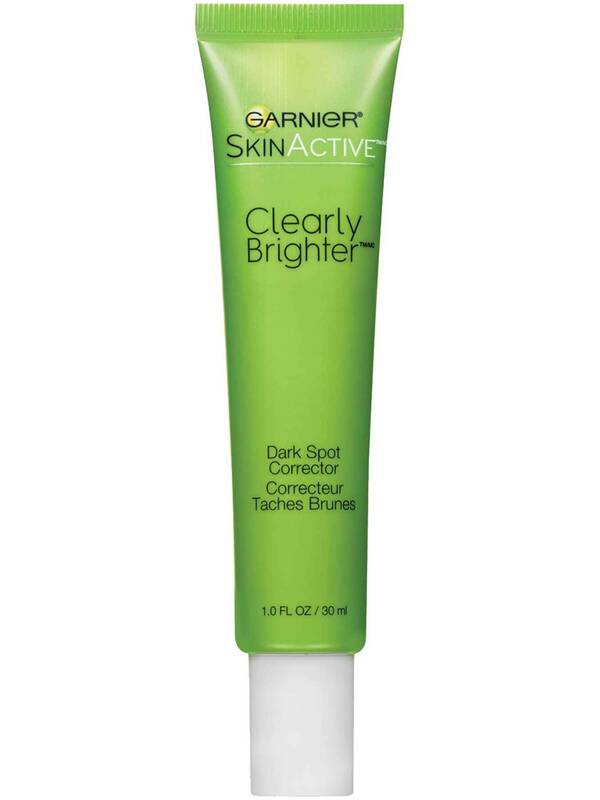 Rated 4 out of 5 by eggwash from Works, but there's caveats I decided to buy the clearly brighter dark spot corrector after being very pleased with Garnier's old "Clinical Dark Spot Corrector". This seems like a watered down version of that - most of the ingredients are the same, but this formula has less vitamin C. I have oily skin with blackheads, occasional whiteheads/cysts, and discoloration from cystic acne in my teens. My skin breaks out less and is less bumpy when I use this as all over my face and neck, but it doesn't really work for targeted areas. It is more moisturizing, though, and I like the smell, but my skin is not sensitive to fragrances. I use this exclusively at night, so I'm not bothered by the glitter, but do find it to be a strange addition. In future products, I would bump up the vitamin C and exclude the glitter. Rated 5 out of 5 by Lizcsen from Such a great product! Y’all, I LOVE this product! I’ve been using it for a few months now and not only has it faded my dark marks from acne, but it’s also evened out my skin overall. It does take a while to see results, but it’s even reversed damage from years ago. It is super light going on and has even helped keep my skin more moisturized and fresh. I use the moisturizer as well in the morning after applying this product and my skin stays fresh and beautiful all day without any need for makeup. 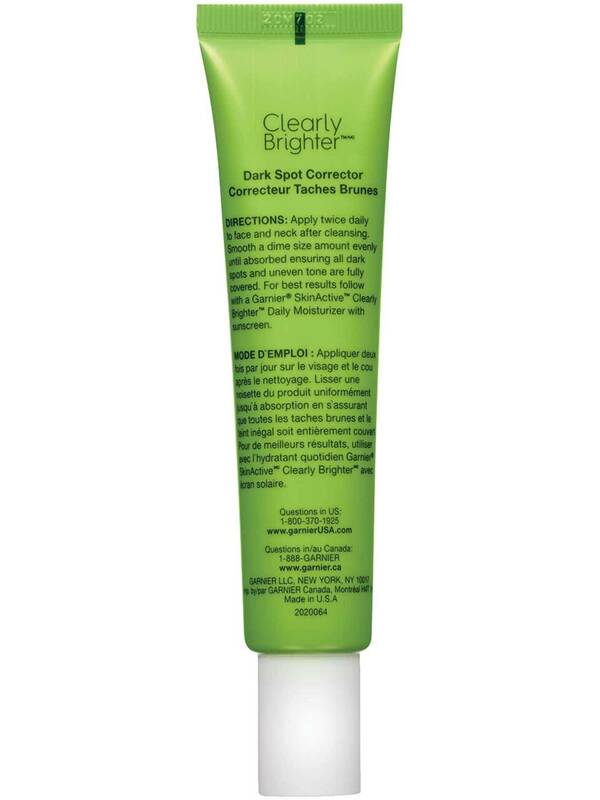 Rated 5 out of 5 by Nalley707 from Great brightener Excellent product. It actually clear up a lot of scars that were impossible to get rid of for years; as a african american, I suffer from hyperpigmentation. Definitely going to invest in other products of this like line. Great job Garnier.